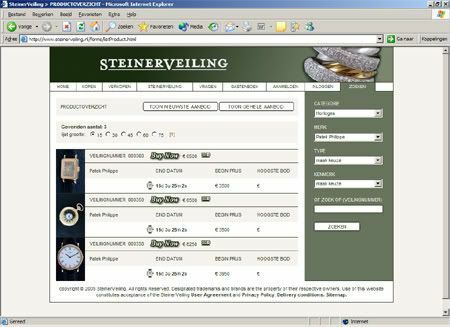 Steiner in Maastricht (NL) expands their sales channel with an auction site. Unfortunately for the non-Dutch speakers, it is in Dutch language.¬?It is also possible for watch owners to sell their time piece through this auction site. Check the website for details. Personally, I think this is a good initiative and I hope that¬?more of these controlled auction sites will start to pop up.¬?I¬?think it helps to create a more trusty scene where watch afficianados can trade without having to fear to receive an empty box or fake watch in their mail after paying hundres or thousands of units (euros/dollars/uk pounds).